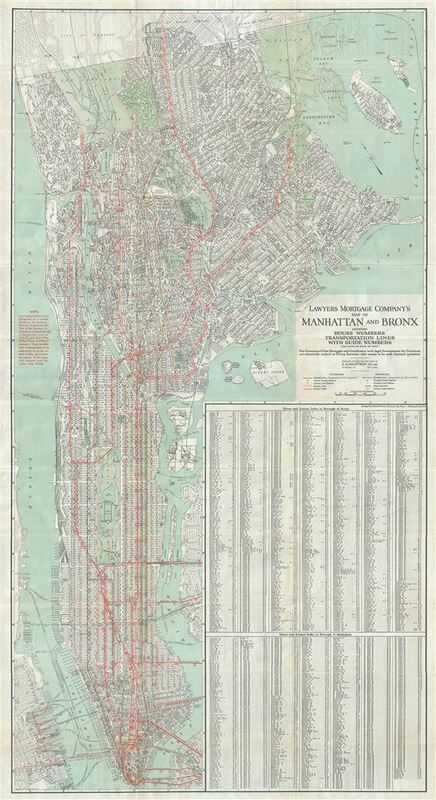 Lawyers Mortgage Company’s Map of Manhattan and Bronx showing House Numbers Transportation Lines with Guide Numbers. This is an excellent map of New York City by the by the A. G. Hagstrom Co. in c.1922. This large scale folding map covers all of Manhattan and the Bronx in extraordinary detail. Parts of Jersey City, Hoboken, Queens and Brooklyn are also featured. In Manhattan, the map covers from what is today Inwood Hill Park south to Battery Park. At the time, Manhattan's northernmost tip was known as Cox's Hill or Tubby Hook Hill, a largely wooded area with trails leading to what used to once be summer estates brought under city control. In the Bronx, the map covers from what is now Riverdale Park east as far as Hart Island. Ward's Island, Riker's Island, Randall's Island, City Island, North and South Brothers Island and City Island are included. Roosevelt Island, then known as Welfare Island is also noted. The bottom right quadrant of the map features street and avenue indexes for the Bronx and Manhattan. Throughout, the map identifies individual streets and avenues, parks, piers, addresses, important stations, railways, ferry lines, bridges and other topography. Subway lines are marked in red while elevated lines are marked in green. This is one of the rare 19th century New York City maps to focus on Northern Manhattan and the Bronx. The map was created by A. G. Hagstrom and published by the Lawyers Mortgage Company.